Tuscany, Toscana, pronounced [tosˈkaːna] is a region in central Italy. The regional capital is Florence (Firenze). Tuscany is known for its landscapes, traditions, histor y, artistic legacy and its influence on high culture. It is regarded as the birthplace of the Renaissance and has been home to many figures influential in the history of art and science, and contain well-known museums such as the Uffizi and the Pitti Palace. Tuscany has over 120 protected nature reserves, making Tuscany and its capital Florence popular tourist destinations that attract millions of tourists every year. 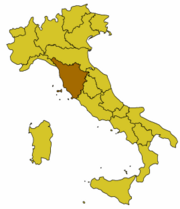 Roughly triangular in shape, Tuscany has a western coastline on the Tyrrhenian Sea, containing the Tuscan Archipelago, of which the largest island is Elba. Surrounded and crossed by major mountain chains, and with few (but fertile) plains, the region has a relief that is dominated by hilly country used for agriculture. Many of Tuscany’s largest cities lie on the banks of the Arno, including the capital Florence, Empoli and Pisa. The climate is fairly mild in the coastal areas, and is harsher and rainy in the interior, with considerable fluctuations in temperature between winter and summer, giving the region a soil-building active freeze-thaw cycle in part accounting for the region’s once having served as a key breadbasket of ancient Rome. Tuscany has an immense cultural and artistic heritage, expressed in the region’s churches, palaces, art galleries, museums, villages and piazzas. Many of these artifacts are found in the main cities, such as Florence and Siena, but also in smaller villages scattered around the region, such as San Gimignano. Tuscany produces wines, including Chianti, Vino Nobile di Montepulciano, Morellino di Scansano and Brunello di Montalcino. Having a strong linguistic and cultural identity, it is sometimes considered “a nation within a nation”. Chianti is arguably the most well-known internationally. So many British tourists come to the area where Chianti wine is produced that this specific area has been nicknamed Chiantishire. Simplicity is central to the Tuscan cuisine. Legumes, bread, cheese, vegetables, mushrooms and fresh fruit are used. Olive oil is made up of Moraiolo, Leccino, and Frantoiano olives. White truffles from San Miniato appear in October and November. Beef of the highest quality comes from the Chiana Valley, specifically a breed known as Chianina used for Florentine steak.